Chop the zucchini and red pepper into chunks about 1 inch in size. Sauté in oil over med-high heat until tender. In a dry medium saucepan toast cumin seeds over moderately low heat, swirling pan occasionally, until fragrant, about 1 minute. Add broth, garlic and water and bring to a boil. Add couscous and immediately cover pan. Remove pan from heat and let couscous stand 5 minutes. 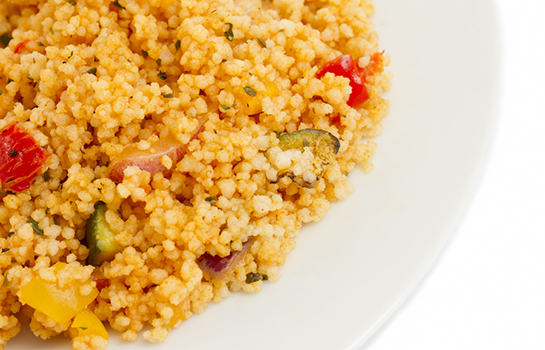 With a fork fluff couscous and in a bowl toss with vegetables and salt to taste.